The Great North of Scotland Railway (GNSR) bought its first hotel in 1891. This was the Palace Hotel at Aberdeen. After an extensive modernisation programme that included electricity and lifts, this venture quickly proved to be a great financial success. This encouraged the GNSR to build a hotel and golf course at Cruden Bay on the coast about 20 miles north of Aberdeen. This was an ideal site for a golf course with a fine bay and sandy beach, but it was located ten miles from the nearest railway line. Hence a new branch was built from Ellon to Cruden Bay, and then five miles on to the fishing town of Boddam. Opening in August 1896, this line had significant engineering works and proved to be expensive to build. The Cruden Bay station was about a third of a mile from the hotel, and the Cruden Bay Tramway was built to connect the two. The tramway opened on 1st June 1899, and was powered by overhead 500V DC from the hotel's own generating station. The track used bullhead rail with a gauge separation of 3ft 6.5in. Typically this track was unpaved, but granite block paving was used where there was public access. The main hotel station was at the hotel's front door, and a small branch went around the back for hotel supplies and laundry. The Cruden Bay Tramway operated two single-deck tram cars, both designed and built by the GNSR at Kittybrewster Works. These were stored in a small shed beside the laundry at the hotel. The trams consisted of a three-window clerestory-roof saloon that could seat sixteen passengers. An elongated platform was provided at one end for baggage and laundry baskets. Each body was mounted on a US-made Peckham Excelsior Type 7B four-wheel cantilever truck. The truck had 2ft 6in diameter wheels on a 6ft 6in wheelbase. Some accounts describe the use of 15hp motors, but Peckham trucks were usually fitted with General Electric GE 800 17hp motors and this appears to have been the case with the Cruden Bay trams. The GNSR livery consisted of purple lake and cream with "Cruden Bay Hotel" in gold shaded letters on the rocker panel. The company monogram was centred on the waist panel. The LNER used a varnished teak livery similar to that used on coaching stock. The hotel was very comfortable in Scotland, and the golf course was one of the best in Scotland, but the season was too short for the venture to be profitable. The railway branch also travelled through relatively poor country and never paid for itself. The Ellon to Boddam branch closed to passengers on 1st November 1932. After this date, hotel guests were taken from Aberdeen using an LNER-owned Rolls Royce motor car. 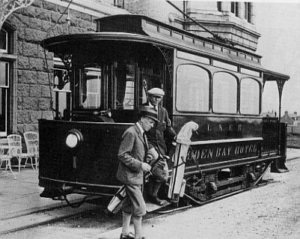 The tram continued to operate, in order to take supplies and laundry to/from the railway which remained open to freight. At the outbreak of World War 2, the hotel was requisitioned by the Government and was used as a Field Training Centre by the Gordon Highlanders. The tram finally closed on 31st December 1940, but the Boddam branch managed to remain open until 7th November 1945. The hotel was sold for demolition in July 1947. Some of the outbuildings and ornamental tramway standards were reported to be still standing in 1955. In 1988, the two ex-Cruden Bay tram bodies were rescued from their fate as a summer house and a shed. These have been combined to form one good body for preservation. The resulting tram now resides at the Grampian Transport Museum. I am not aware of any models of the Cruden Bay tram cars in any scale.